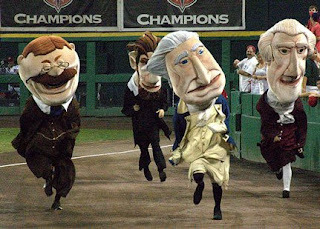 First of all, HOORAY ELECTION DAY. Get out and do your duty as an American. We don’t care who you vote for, but just vote. Speaking of votes, have you noticed the movement in our own little BS election? The Brinkhater-Sedihawk ticket has seen a surge of late, overtaking Sir Grippi and now holding on to a slim lead. Wow. Anyway, you have until 9 PM tonight, so if you haven’t yet done so, vote for your favorites. Now for some sad news. 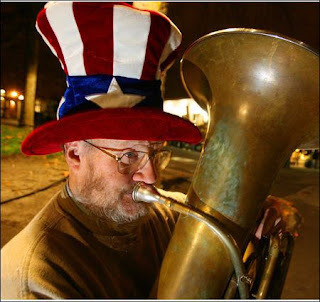 Many a Coug fan who made their way through Pioneer Square or down by Qwest or Safeco will feel a sense of loss when the P-I reports that Seattle icon Tuba Man has passed away. Tuba Man was always cool to Cougs. I can’t tell you how many times we would see him late in the evening, and he was always quick to fire up the WSU fight song on demand. It used to piss off UW fans who would walk by, but we sure loved it. And he knew the obscure songs as well, like Chicken Dance. Just a cool guy. The worst part of the story is how he died. He was beaten repeatedly and robbed by five teenage thugs while waiting for a bus. Just a brutal, senseless attack on a guy who only loved to do what he did, and didn’t bother anyone. They’ve captured two of the morons who did this, but let’s hope they nail the three others as well. RIP Tuba Man. You will be missed. 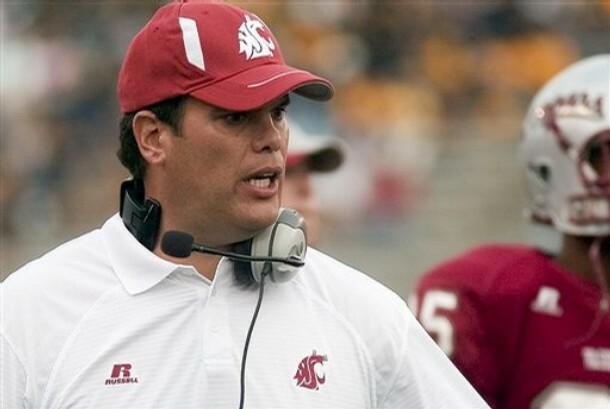 Not much new in the way of Coug news today. But here’s a question that many of us are seeing more and more of as the season progresses. Do YOU think that Coach Wulff has been “throwing his kids under the bus” just a little too much? Many comments I’ve read on other sites and message boards has some fans pretty upset right now in the way Wulff laments the lack of talent and character on his current team. Many feel that Wulff is blaming the current upper-classmen for how bad they are, as a way to deflect blame from himself and his staff. What do you think? Some will claim that the job of a head coach is to take the pressure off the players and put it all on himself, something that a hall-of-famer like Mike Holmgren is famous for. You know, be the stand-up guy as the driver of the bus, so to speak, and be the one to take the heat. But if there is one thing we have seen from Wulff, since the day he took the job? The guy is HONEST, period. There is very little dancing around, very little deception, with how he answers questions. He doesn’t hide behind the rhetoric of coach-speak 101. And he hasn’t been shy to talk about how surprised he has been, since day one, at the challenge that was waiting for him. Anyone remember how he talked in the spring, that players didn’t even know how to properly get into a 3-point stance?? That from the beginning, they have had to literally tear these guys down to their foundation and rebuild them up with fundamentals they sorely lacked? Remember his mid-August rip job in the media about the lack of toughness, when seemingly half the team was sitting out a practice with injuries and standing around on the sidelines, not really into what’s going on? How about during the first month of the season, players were still blowing off meals? Or how Mike Graise was just kicked off the team last week for missing practices?? It’s just been one thing, after another, after another. I think it’s honestly hard to judge right now based on where the program currently resides. So much has gone wrong, since before the season even started. But both Kevin Lopina and Romeo Pellum said after the Stanford game that players don’t trust coaches or other teammates, and are simply giving up. Is that Wulff’s fault? It was the same thing after the USC game, with Lopina and Andy Mattingly were on the record calling out their teammates who were quitting. He’s going to call it like he sees it, and if it hurts some feelings, so be it. This season is just such a throw-away disaster, and Wulff walked into such a mess, that it’s truly not fair to judge him right now. I will continue to bang the 2010 drum (or 2011??) before we know if this is going to work out. But man, does this program need to turn the page to next year or what?? For the benefit of the current players, the seniors, the coaches, the recruits, everyone just needs to get this season in the books and look forward to their future. That’s it. ENJOY YOUR TUESDAY. Remember to vote. As always, GO COUGS! You are currently browsing the archives for the Tuba Man category.